Lot Detail - Cliff Koroll's 1973-74 Chicago Black Hawks Game-Worn Durene Jersey - Team Repairs! Cliff Koroll's 1973-74 Chicago Black Hawks Game-Worn Durene Jersey - Team Repairs! 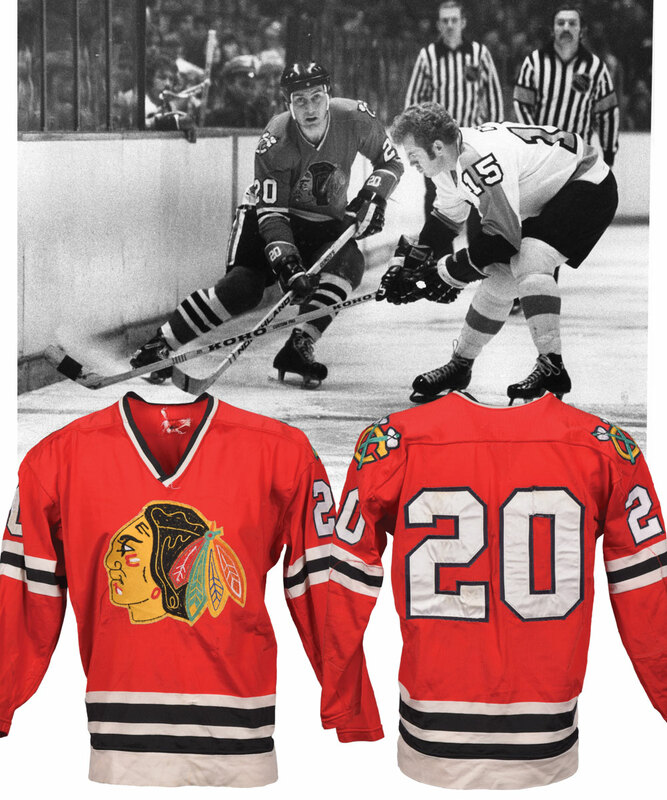 This classic Black Hawks red durene jersey was originally worn in 1973-74 by Cliff Koroll, who wore No. 20 with Chicago from 1970-80. It displays 18 team repairs and has a garter-style fight strap. The "73" patch is sewn inside the right rear hem. Wilson size 48 tagging in the back of the neck is frayed and only has part of the stitching remaining on the bottom edge, while the Gunzo’s tag that should be below it is missing. 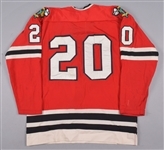 There is evidence of a former nameplate, most likely one that was on and off this gamer, sewn on for Hawks road games that were broadcast nationally by NBC in the United States, and removed for other games. There is a bit of blue paint transfer on the left sleeve among the rest of the game wear. There are three team repairs on the front, three on the upper back, including one through the top of the “0”, nine on the right sleeve, and three on the left sleeve. Other game wear shows in fabric runs, inner pilling, faint marks and a light stain on the front tail, and black marks on the sleeves. 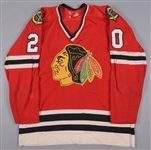 The ghostly thread-hole outlines of square patches of material that once covered up the tomahawks on the shoulders indicate that this game-worn jersey spent time in the minors with a Black Hawks affiliate team.